The May edition of Essential Kitchens, Bathrooms, Bedrooms Magazine lists CDA’s sk450ss eco-clean single electric multifunction oven as part of their feature, focusing on how to “tie together a streamlined kitchen design with a sleek integrated oven jam-packed with the latest technology”. 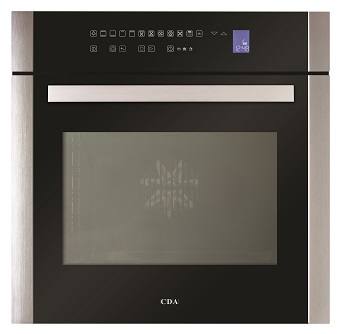 “CDA whisks away the hassle of oven cleaning with its new built-in multi-functional model-which has a unique intuitive cleaning system that works with catalytic liners. All you have to do is wipe down the oven afterwards, leaving you more time to take advantage of the 11 different cooking functions.” The sk450ss not only offers the eco- clean system, that works at a low temperature to reduce energy costs providing an easy clean oven whilst still being highly efficient, it also comes with a useful temperature probe for accurate cooking, a programmable recipe setting and a safety key lock. A quick pre-heating ‘boost’ setting reduces the time this oven takes to come up to temperature whilst the stylish new look control panel is completely touch controlled.